This is a four-part Special Feature from the summer of 2008 where, for four weeks, I put two superhero movies head-to-head to see which one was better, or if I could even make it through both of them. 1. I must designate one movie as “Good” and one as “Bad” before viewing; If I’m mistaken about the designation, I’ll fess up to it. 2. I must watch all of the movie designated “good,” but I can stop watching the “bad” movie if I can’t tolerate it any more, as long as I record how far I made it through the movie. 3. The must not have viewed the chosen movie in the past six months, so that my memories of the chosen films aren’t too vivid. 4. The two films chosen weekly must have a thematic and/or stylistic relationship with one another. So without further ado, here’s Superhero Mania: Week 3. This is the first movie I’ve written about for this column that I’ve never seen before. 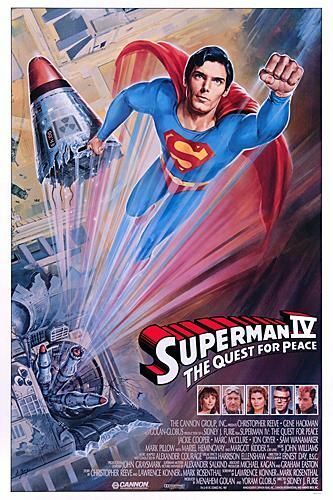 I own (and cherish) the 14-Disc Superman box set which collects all the films since the original 1978 outing, but after suffering through the awful Superman III, I couldn’t bring myself to watch the fourth, which I’ve heard nothing but bad things about. Well, as you can tell, I didn’t much like it either; I only made it a third of the way through before turning it off. However, I didn’t have the same hugely negative reaction to this film as I did to Hulk or Fantastic Four; the best way to describe Superman IV is that its like watching your best friend become a drug addict. What do I mean by that? Let me explain. The original Superman film is unbelievably excellent, and the sequel is pretty darn good. I have lots of affection for these films, as I would a friend. Superman IV tries to do the right thing, but ends up failing horribly and it’s painful to watch these fine actors degrade themselves in such a shameful manner. You get the same sick sensation you would watching your best friend ruin their life by becoming a drug addict. The difference? You could help your friend. There’s no way to save Superman. Almost the entire cast from previous movies returns for this installment, and they all do their best. But even a good actor can start to look like a Razzie-winner when they work with bad material. Christopher Reeve is trying his hardest, and the film is worth seeing simply to witness his final performance as Superman. He’s sincere and the performance is full of heart, but the script is just terrible. I only made it half an hour through, and nothing really happened. The movie opens with poorly animated opening credits followed by a scene where Superman saves some astronauts. Was Superman just flying around in space when he saw these astronauts in trouble? That’s ridiculous. Something you’ll notice right off the bat is that the effects are terrible. I know this was the eighties, but these effects would be bad for the forties, and the effects in the other movies are much, much better, Superman looks animated half of the time and there’s an outline around characters whenever they’re on a blue screen. There’s a subplot about the Daily Planet becoming a tabloid which is really annoying and poorly written. Gene Hackman returns as Lex Luthor, but again, the writing is poor and his sidekick is some bratty teenager. Lois and Clark’s relationship is just a rehash of things we’ve seen before, and feels really forced and unnatural, like it was written by someone who had only scene clips of scenes with these characters before. The main problem with this film is takes itself seriously. It tries very hard to be like the first two films; serious and dramatic, but there’s so many stupid scenes. For instance, there’s a scene in a museum where Lex finds a Superman exhibit, where a piece of Superman’s hair is holding a 1000 pound ball. When was it established that Superman’s hair has superpowers? And how did they get his hair? I can’t outright hate this film because it has good intentions; the nuclear arms plot is supposed to be a lesson for the world, and it tries hard to be like the original film, but it fails miserably. I like this film more than Superman III because it doesn’t try to parody the franchise, but it still is a colossal mess. It’s sad to watch the series die like this; I made it 31 minutes through not because it was terrible, but because I couldn’t stand to see the series die like this. The first Superman film is not only among the five best superhero films ever made, it’s the movie that created the superhero film. Every single superhero movie since 1978 should put a dedication to this film in the end credits; it’s groundbreaking. Richard Donner, his pal Tom Mankiewicz, and Mario Puzo are the men responsible for this brilliant film. They realized that just because it’s based on a comic-book doesn’t mean it doesn’t deserve the same respect as films derived from other material. The film is epic in scope and while fun, serious about the material. The film was so ambitious that Mario Puzo’s original script was cut in half, planned to be released as two films six months apart. Richard Donner was hired to direct the project, a mammoth undertaking that was unheard of. He was shooting two movies at once, which had never happened before. Sadly, the grand idea of a two-part epic Superman movie never materialized, but more on that later. The movie took an approach never seen in superhero cinema before; it concentrated on the human side of the superhero rather than the super-powered alter-ego. The film is very character based, and is all about problems Clark Kent has becoming the man of steel. It’s a multi-dimensional story about fathers and sons as well. Christopher Reeve created the modern superhero performance with his amazing portrayal of Kent. He inhabits this role so completely that you can’t picture him in any other role. Marlon Brando received top billing, but his role is brief. Brief but brilliant. He plays Jor-El, and as always, if fantastic. Gene Hackman often steals the show as Lex Luthor, a villain you love and hate at the same time. Margot Kidder established the modern superhero-girlfriend role by playing Lois Lane as more than just the damsel in distress. The effects are essential in bringing Superman to the screen, and as the posters stated, you will believe a man can fly. The effects are somewhat dated by today’s standard, but hold up surprisingly well. Superman: The Movie is an epic, plain and simple. The story spans galaxies, and brings us from Krypton to Smallville to Metropolis while following the story of Clark Kent. The action is exciting and steady, but the film never forgets that character comes first. The “can you read my mind” scene may be cheesy, but what it represents is the glue that holds the film together. Superman is probably the least interesting superhero; his powers make him invincible, which means there really isn’t a struggle when he goes to battle. The most amazing achievement of this film is that it makes him just as interesting as any other superhero; perhaps more so. As I said above, the film was envisioned as a two parter, and Donner had shot almost the entire two part movie before he was fired from the project and replaced with hack director Richard Lester, who reshot Superman II to be a campy action flick. Superman II in its theatrical form is pretty awful, but a few years ago, Warner Bros. gave Donner and a team of editors the money to re-edit Superman II. And this wasn’t a simple “Add scenes here,” “Remove scenes there.” It’s a totally different film, and worthy of the title “Superman II.” I love it. While not nearly as good as it would have been had Donner been allowed to finish the movie his way, it is a glimpse into how perfect this two-part epic would have been. While the plans for a two-part epic never fully materialized, we still have Superman: The Movie, a gem that should be relished by all fans of superheroes. Come back next week for the final installment of Superhero Mania! For the final week, we’ll return to the fortress of solitude to look at the film that, for all intents and purposes, stabbed the man of steel with a shard of kryptonite, and the film that brought him back in a blaze of glory. Don’t miss it!